Our friend Tina Louise, is a notable actress ( Gilligan’s Island) and an Academy Member. She invited us to accompany her to the Academy Members Screening of the movie “Boyhood” and afterwards a conversation with director Richard Linklater (Slacker, Dazed and Confused), and lead actors Patricia Arquette and Ellar Coltrane. 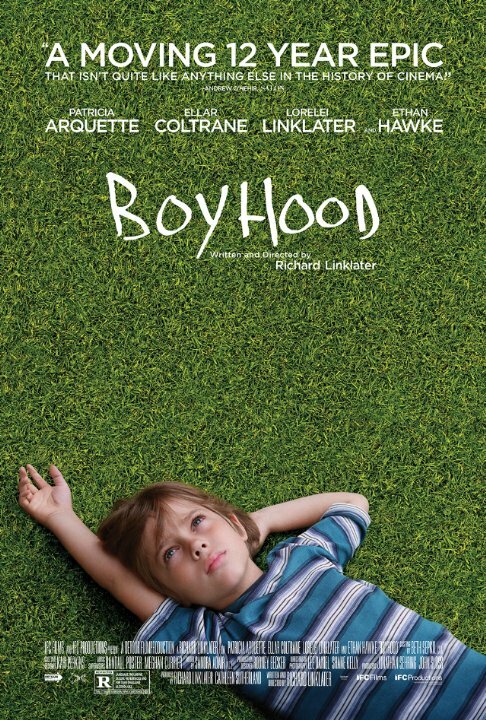 Boyhood is a drama film which has a relatively simple story line of a boy growing up with all the challenges and fun things that come with it. The only thing that is different from other movies that have a story line like that, is that they actually filmed everything over a 12 – year (!) period. The boy Mason played by Ellar literally grew up in front of the camera from 6 years old to an 18 year 12th grade student. As did his movie sister Samantha, who turns out to be the real-life daughter of the director, Lorelei Linklater. I thought she was an excellent actress by the way. When you watch the movie you see everyone age and grow up, but you don’t really feel like it was filmed on so many occasions over such a long period of time, because the acting of everyone is very consistent. That makes you really believe that we are watching a boy grow up and a family evolve. Other parts are played by Patricia Arquette as Olivia. She is the mother, and had these 2 kids with Mason Sr., played by Ethan Hawke. These 2 actors you also see age over this 12 year period, although Patricia Arquette did not show many signs of aging. What intrigued me more than the movie itself even, was the conversation with the lead actors and director afterwards. You get to know many fun facts of the movie. Director and screenplay writer Linklater, who also directed School of Rock a movie I adore, gave some insight into the making of this film. – They really filmed everything spread over a 12 year period, and everyone made time to come film. – This was a low-budget film and I don’t think the actors got paid (much). – The director got a lot of creative freedom from his distribution company IFC. – Although it sometimes feels like improv, everything was scripted and rehearsed. The actors were involved in the writing of the scenes and the scenes were often finished just before shooting. – After the boy was cast, they were looking for a girl, but Linklater’s daughter Lorelei made it clear from the beginning she wanted to play that part of the sister. – None of the actors have seen footage that was filmed in the 12-year period. The first time they saw anything was when the film was released. -Patricia Arquette said she watched it for the very first time in the middle of an audience at Sundance. She said she sat there with 3 different visions. one as the actress’ vision, one as a viewer’s vision, and one as the mother’s vision because she saw things that Mason did that she did not know about in the script and she got angry about, but she also saw parts with Mason she was like “ahh, that’s so sweet!”. I wanted to know if Ellar grew up like his character Mason, and if he is like his character. When Tina went to speak to the director and the actors, she said afterwards he was a bit shy, and that he loves acting and photography. So I do think Ellar is a bit like his character Mason. Boyhood movie is released all across America July 18th. It got rave reviews, and 100% on rotten tomatoes out of 95 reviews. that means a 100% score. Boyhood is a perfect slow movie unlike all these fast blockbuster movies out these days, which basically shows life as most of us know it. The transformation to see a boy grow up in front of the camera in just 2.5 hours is amazing.